An outstanding performance venue, the 600-seat Maurice Gusman Concert Hall is used for a variety of events including recitals, concerts, recordings, and other related projects. The School’s largest ensembles perform here as well as many of the smaller ensembles. To view the seating chart, click here. The Maurice Gusman Concert Hall is also used throughout the year for an array of special events including the Frost School’s annual Frost Music Live!, an extraordinary line-up of over 100 concerts and events in four themes: Frost Classics; Jazz, Pops & Beyond, Frost Faculty Recitals; and Frost Lectures. Frost Music Live includes the Signature Series, an unparalleled offering of concerts with top GRAMMY®, Emmy®, and Tony® award-winning and nominated guest artists, collaborating with the highly acclaimed Frost School of Music faculty artists and students. Several hundred high school students gather in Gusman Concert Hall each year for Honor Band, Honor Choir and for performances and master classes with related faculty. 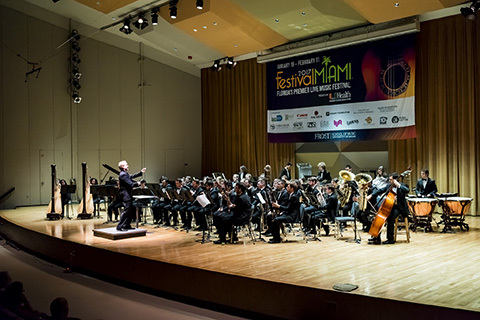 The Gusman Concert Hall is named in honor of the late Maurice Gusman, a beloved donor to the University of Miami.